There’s a new excitement in the air at Ohio State Mansfield, more so than in any other year since I became dean and director. You could feel it as our incoming freshmen and faculty proudly sang Carmen Ohio at convocation and then gathered for the Dean’s picnic. New students explored vast opportunities both on and off campus at the Involvement and Community Fair. They are filling the bleachers at volleyball games. Our newly renovated Bromfield Library and Information Commons is the go-to place for students to meet with faculty for some extra one-on-one time or to curl up with a book. By the time you read this, there will be new furniture in the cafeteria although the actual renovation won’t take place until May. We are meeting with North Central State College representatives and community leaders to plan for a new campus entryway, one that will also signal the entrance to an eventual campus district. Before the ribbon even had been cut at Buckeye Village, developers were talking about nearly doubling the original projected 500 beds. Ontario government officials revealed plans to provide sidewalks from Buckeye Village to the shopping areas. We formalized a long-standing partnership with Ashland University’s Dwight Schar College of Nursing and Health Sciences to guarantee transfers for our best and brightest nursing students. The agreement allows students across the region to complete core coursework at state college tuition rates and then transfer as a junior to Ashland. Surveyors could be seen outside Riedl Hall in the wetlands last week, marking what will become an outdoor classroom for both our environmental studies program and community school districts. You can read more about our EcoLab project on our Planning and Projects page at mansfield.osu.edu/about-osu-mansfield/planning-and-project-office. So buckle your seatbelts. We’re rolling down the runway and Ohio State Mansfield is ready for takeoff! Who are the Mansfield Mavericks? There’s a hidden gem on the Mansfield campus and Athletics Director Mike LaCroix wants fans to find it. The Ohio State University at Mansfield and North Central State College collectively field intercollegiate teams in the form of the Mansfield Mavericks. The Mavericks were formed in 2005 and now play six sports – volleyball, men’s soccer, men’s and women’s basketball, baseball and cheerleading. In 2010, they joined the Ohio Regional Campus Conference, which includes 10 other member schools. Although the Mavericks have shown success as state runner-ups four times, they are relatively unknown locally. But this year, the playing field has changed with nearly half of incoming freshmen living in on- and off-campus dorms. That expands the talent pool to student-athletes from across Northeast Ohio as well as more fans. When Buckeye Village is fully developed, the campus population could become more than 50 percent residential, says Ohio State Mansfield Dean and Director Stephen Gavazzi. There are no athletic scholarships offered. Student-athletes play for the love of the sport. That’s what drew new volleyball coach Connie Surowicz to the campus, as well as a chance to shape a relatively new program. 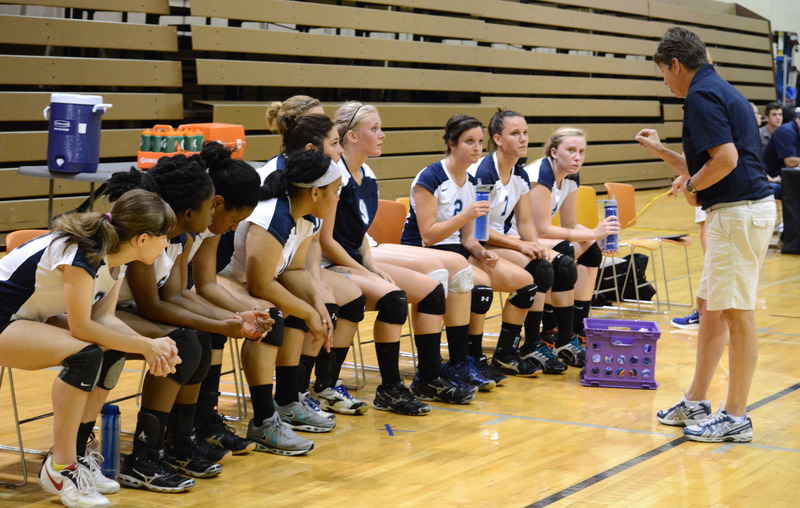 She has coached collegiately for more than 20 years, at Ashland University and Wittenberg College, among others. ORCC, as the governing body, conducts state tournaments and awards an all-sports trophy to the most successful regional campus sports program each year, according to Brett Whitacker, ORCC secretary and treasurer, and athletic director for the Newark campus. ORCC also names all-conference team members and honors all-academic students, those who attend full-time and maintain at least a 3.0 GPA during their semester of sports participation. Since joining the conference, the Mavericks have fielded 53 all-academic students. Phil Schmook, a 29-year high school coaching veteran, was recently hired as men’s basketball coach. He understands the dual role academics and athletics plays. “The long term goal here is to have this program be attractive to young people that want to come in here and understand that basketball is important and you love doing that but it’s also pretty darn important to get the academic piece of life taken care of so that you can be a productive member of society,” he said. 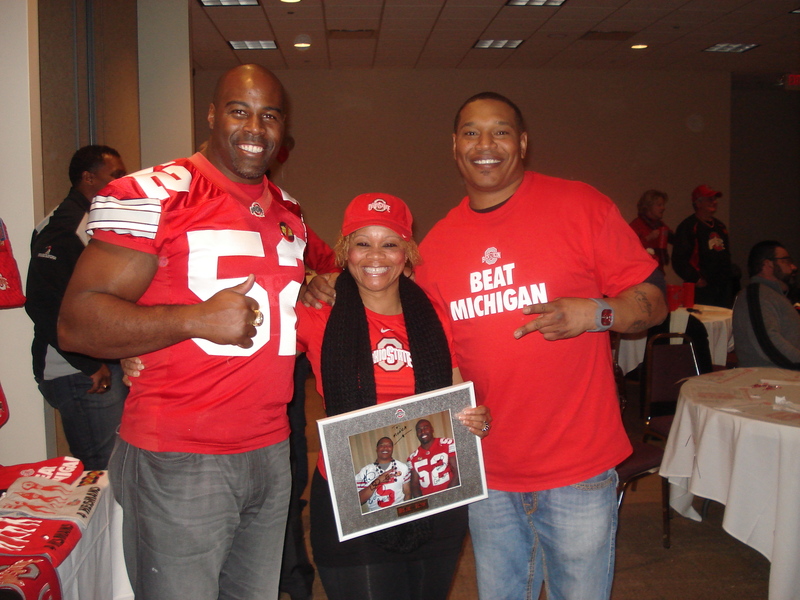 Monica Homer, center, holds a signed photo from football alumni James Cotton and Courtland Bullard she received at Buckeye Bash 2014. The Ohio State University at Mansfield is fortunate to have support from two county alumni clubs – Richland County and Knox County. The alumni clubs are part of a network of more than 200 locations throughout the world that provide opportunities for continued friendship and service to Ohio State. “Our main purpose is to support Ohio State Mansfield and to provide scholarships for Richland County students,” said Richland County president Kathy Russell. The Richland County Alumni Club established an endowment that provides full tuition scholarships to new students graduating from a Richland County high school. Awards are made by the club, based on high school grades, ACT scores, application questionnaire, and personal interview with the club scholarship committee. 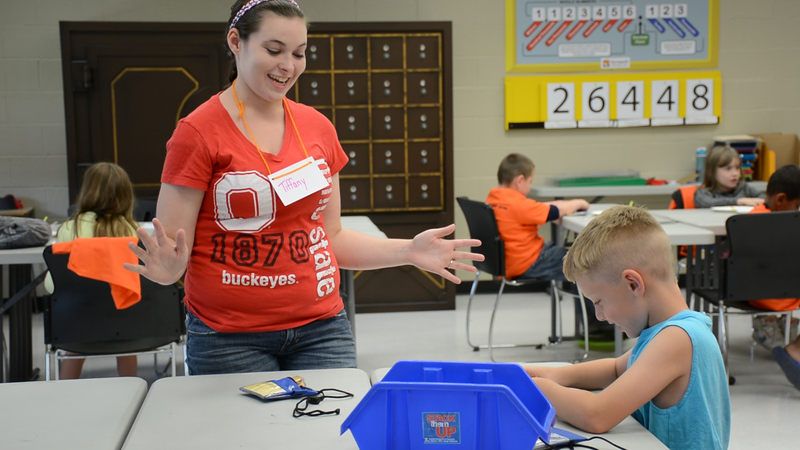 Money is raised for the scholarships and other needs through the club’s annual Buckeye Bash. This year’s event includes featured speaker Jim Tressel, Buckeyes head football coach from 2001 to 2010 and currently president of Youngstown State University. Tressel’s career at Ohio State included an overall record of 94–22, including six Big Ten Conference championships, a 5–4 bowl record and a 4–3 record in BCS bowl games. Buckeye Bash is scheduled for Nov. 24 at the Mid-Ohio Conference Center, 890 W. Fourth St., in Mansfield. Doors open at 5:30 p.m. and Tressel will speak around 7 p.m. The evening also includes live and silent auctions of Ohio State memorabilia and performance by members of the Ohio State Marching Band. “It’s really a fun night, full of Buckeye spirit and for a great cause, and we are very excited that Jim Tressel will join us this year,” Russell said. The Knox County Alumni Club also hosts a fundraiser – Buckeye Spirit Event – to provide scholarships for Knox County Students. The event this year will be held Oct. 21. Check our calendar for more information. Josh Hurrell, a junior at The Ohio State University at Mansfield, is the new student-veteran community advocate. 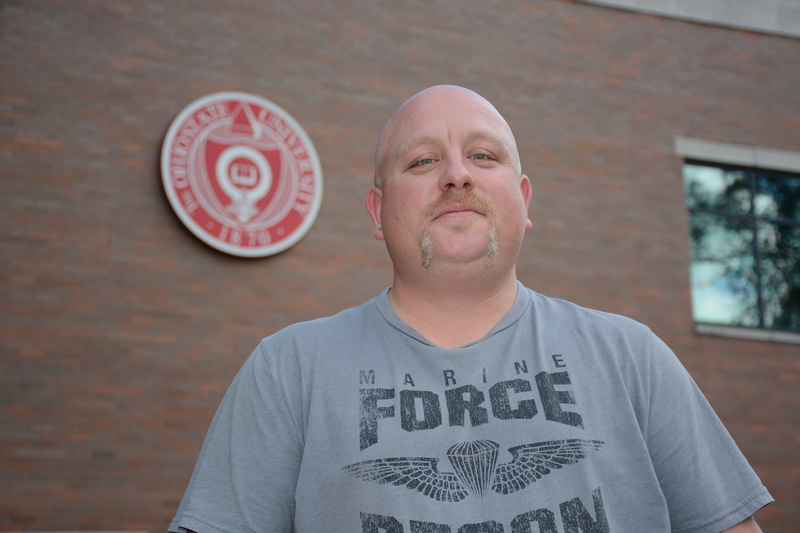 Student-veterans helping other veterans adjust to college life is the focus of a new position created at The Ohio State University at Mansfield. Junior Josh Hurrell, a Gulf War veteran, has been selected to receive a scholarship and position as Student-Veteran Community Advocate. For the first time this year, the Ohio State Columbus-based program has offered scholarships at the regional campuses. In addition to the scholarship, Hurrell received $1,000 to provide four events and programs for Ohio State Mansfield student-veterans. Hurrell, a Social Work major, has already conducted an ice cream social pairing tots and veterans at the campus Child Development Center in August, and hosted an information booth at the recent Involvement and Community Fair on campus. He is planning two Veteran’s Day events – a National Roll Call on campus in November and participation in the Mansfield Veteran’s Day Parade. He estimates there are about 50 to 75 student-veterans on campus as well as about 15 faculty and staff. The U.S. Marine Corp veteran is no stranger to involvement on campus. Hurrell is a Buckeye Ambassador, vice president of the Student Veterans Association, co-president of the Multicultural Association and Campus Activities Board member.